You’ve already gifted your friend or family member who loves to cook with the usual kitchen gadgets in previous years and you’re really stuck for ideas this year. What else can you find that will surprise him or her and be really appreciated for its usefulness? The answer may lie in the rise of smart gadgets and appliances. Being able to control them from afar can save time and energy and a boon for the busy cook. That’s why these smart kitchen gadget gift ideas may be just what you’re looking for. Before you consider buying any of these, you must be sure that the recipient will be able to use them to its full extent. For example, while some smart gadgets can be programmed directly from its attached control panel or by setting it to operate at a later time, the main reason to give it as a gift is to enable the recipient to control the gadget from her Bluetooth, WIFI or 3G/4G enabled device whenever she wants. This is usually done through the use of apps that have to be installed on that person’s device and many apps are designed to work only on the latest ones. If the smartphone, laptop or tablet itself doesn’t work with any of the above technologies or won’t handle the app, then the intended use of the gadget won’t be fully realized. The same should be ascertained in the opposite case. There may be times when the cook won’t want to use the app and instead program the gadget directly, so that should be possible too. The following smart kitchen gadgets are not only clever ones but also practical to use. They will also be great conversation starters at the host’s parties! If you’ve never heard of Sous Vide cooking, it means slow cooking a food ingredient that’s packed in a sealed bag and dropped into water or other liquid that’s held in a suitable pot. There are two types of sous vide cookers – a water oven type which is a pot with an inbuilt sous vide cooking element, and an immersion type where the heating and circulating cooker is immersed in any pot containing the liquid. The Anova is the latter type and comes in two models – one is a simple bluetooth model and the other is a dual bluetooth and WIFI model. We already rated the bluetooth Anova as one of the best sous vide cookers available on the market with or without smart connectivity when it was relatively new, but if you can stretch your budget a little bit, we think you should consider the more advanced Anova WiFi Sous Vide Precision Cooker model that gives you a choice between bluetooth and WIFI connectivity. You can take any food you’d like, place it into a food-safe sealable bag, drop it into a pot full of water and attach the Anova Precision Cooker to the side. The Anova will heat and circulate the water, sending the temperature to a smart phone to let you know the exact cooking temp. Because it slow cooks your food, it will virtually never overcook and you can control all of its cooking functions by the touch of your smart phone screen. Sous Vide is a style of cooking that is unrushed, so this type of cooking and gift may not be for everyone. However, even the busiest cook might like to bring it out over holiday weekends to dazzle his guests with his advanced culinary skills. Who doesn’t love a good slow cooker? We used to just two types of these cookers to choose from – a simple manual one that you manually turn on after selecting from just 3 power levels and a programmable one that you can set to turn on at a later time and had more cooking functions and power levels to choose from. The latter allows you to get your cooker started at any time of day even if you aren’t at home because you can program it to start on its own. If you time it just right, the dish could be done just as you walk in the door. Now we have a third choice of slow cooker – the 6 quart Wifi-Enabled Crock-Pot Smart WeMo Slow Cooker is a remote controlled crock pot that can be controlled by a smart phone app. Belkin’s WeMo system of home automation is embedded in this Crock Pot, like so many other products, enabling you to control it by using the free WeMo app from your Apple or Android phone. The app is incredibly simple to use and it is literally like having a remote in your hand, From virtually anywhere, you can turn the pot on, set the temp, start it cooking, delay the functions or turn it off. 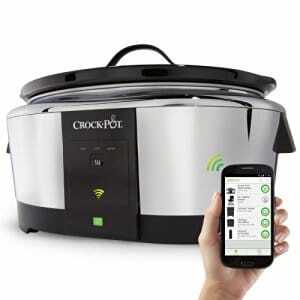 It gives you complete control over your crock pot cooking right from your smartphone screen. It can also be used without the app because of the control buttons on its base. If you know of someone who loves gadgets in their kitchen, this might be a good one to give. It gives complete control when slow cooking, and for someone on the go, at work or play, being able to adjust the cooking settings might mean the difference between a meal that’s ready for dinner or a meal that needs to take a couple of more hours to cook. It allows you to be flexible with the cooking time, so if you think you’re going to be at work longer than expected, there’s no need to set the start cooking time before you leave home. Just estimate when you’ll actually be back and start the cooking at the right time. That way, if the dish is done cooking, the food won’t sit in the pot for too long before you eat it – something that is not advisable because of food safety issues. In the same way, if you suddenly find that the dish might take too long, you can increase the power level so that it gets done by the time you’re ready to eat. Made by iDevices in collaboration with Weber, the foremost grilling manufacturer in the country, the iGrill2 Bluetooth Thermometer might be the best cooking accessory ever and could also be a great gift for anyone that loves grilling. At a party, the the cook doesn’t have to hover over the food as it cooks for fear of it being overdone or even burning. This device monitors it for you while you go mingle. Think of it as a thermometer that can be monitored from up to 150 feet away. By using the Bluetooth feature, it will give you direct temperatures on your smart phone for any type of food you are cooking. Simply insert one, or all of the 4 probes into meat, casseroles, fish or what have you, program in the finished temp that you want, and when that temperature is reached, your smart phone will let you know via the free iDevices Connected app. It even has a suction cup so that you can stick it to the side of an oven and monitor the temp. Two of the probes are ideal for meat as they can stand up to higher heat and even steam. If you know someone who is totally into grilling, there probably is not a better gift than this one. Being able to monitor the temperature of food on the grill takes it to a new level. Even the novice griller will make better food just by using this, and the experienced griller has a world class tool for cooking perfect food every time. If your gift recipient loves coffee and gadgets, then look no further than the Mr. Coffee Smart 10-Cup Brew Coffeemaker. Not only can she control the entire brewing process while away from the machine but the brewing process is one of the fasted possible for a drip coffee maker, like the non-automated ones we’ve reviewed before. It heats up the water to the optimal temperature to ensure a great tasting cup too. The Mr. Coffee Optimal Brew Coffeemaker also uses the WeMo app that works with virtually any smart phone or tablet. You’ll have complete control over when to turn on or off the unit, the coffee maker can be programmed to whenever you want to make coffee, and you can do all of this even while away from home. You can wake up in the morning, coming home for a cup in the evening, or if guests are on the way, turn the coffee maker on remotely and by the time you get to the kitchen, you’ll have hot coffee ready and waiting. The WeMo app is part of a home automation system by Belkin and it will sync with many compatible computerized appliances. If you have more than one of these products, you’ll be able to control them all from just this one phone app. If you don’t want to use the app, you can operate the machine manually just like any other coffee maker. The Mr. Coffee Smart Brew could potentially make someone a terrific gift! If they love coffee and gadgets, this one might be ideal. Not only is it an exciting gadget, but it’s also a great coffee maker with several good features, like the thermal carafe that keeps coffee hot for a while, the removable water reservoir to enable easy filling at the sink, and the removable brew basket for easy cleaning and quick filling with grounds and filter. Even scales have gone over to the computer age and the Drop Kitchen Scale is one of the neatest kitchen gadgets to use. Why struggle with scaling recipes, finding the perfect recipe and then wondering if it’s too difficult to try? You must download the Drop Kitchen app onto any of your iOS devices and sync it to the Drop Scale, then once your smartphone or tablet is working with the Drop, the fun begins. Think of it as a digital scale with a monitor as an interface. When you weigh things on the scale, you’ll see the exact weight on the monitor. Plus, it comes with an interactive recipe app too! That means you can search for a recipe, and when it comes up, the detailed pictures will tell you exactly what ingredients to add, how much you need, and how long to bake or cook. If you want to scale the selected recipe for the right number of people, it’ll tell you how to scale each ingredient too. You can even add in your own recipes too. Not only will it save time in the kitchen, it is also a lot of fun to use. Anyone who loves to bake or cook will love this! It takes a lot of the guess work out of measurements, yet there is still room to wiggle by adding a pinch more here and there. You can actually see exactly what you are doing on a video screen, and if you have kids, they will always want to help. As a beginner, this is just about the perfect tool. You’ll turn into an expert overnight, just by following the instructions and adding the correct amount of ingredients. In addition to the Drop App’s own recipe database, there are selected recipes provided by featured partners like Good Housekeeping, Food52 and a host of well known food bloggers and expert chefs. You just can’t go wrong. There may never be a perfect baking device or app, but this is as close as it comes. Of course, if you think a better gift is a normal digital kitchen scale, we have reviewed some top rated ones for you. If someone is concerned about their eating habits wants to modify them, the Hapilabs Smart Fork may get them on the right track by monitoring the pace of their meal when they eat with the fork. While it can’t be called a weight loss device, it is marketed with that in mind. By using this fork you have the capability to modify your eating habits and essentially lose weight. Eating fast is directly correlated to weight gain and heartburn, two issues that overweight people have. It takes 20 minutes for your body to feel full, so the faster you eat the more you CAN eat until you actually feel full. Filling your stomach quickly leads to acid reflux, so not only are you stuffed but you’ll have major heartburn as well. The Smart Fork actually paces your eating and reminds you if you are eating too fast, by vibrating in your hand. When using the fork to guide the speed at which you eat, you will eat less over a longer period of time yet feel just as full. By using this fork and sticking to it, you can certainly modify your eating habits. It can be paired with a bluetooth enabled device via the HAPIfork app to see eating stats in real time. These stats include how long your meal took, how many fork servings you had per minute, and a few more. These can be uploaded via USB to the HAPI.com website for analysis and coaching to help you improve your eating habits. It could make a great gift if someone really wants to change the way they eat. Same could be said if you view it as more of a gag gift that the recipient can laugh about. It could also make a lousy gift if you yourself decide that someone needs to change the way they eat, and they don’t use it and resent you for giving it to them. Perhaps the best thing to do would be to give this to yourself as a gift. If you are on the path to eating better and healthier, this could be a very effective way to keep your eating habits on track while you take care of the other aspects of healthy living. For those that don’t want to have to keep tabs on something as basic as filtered water, having a water filter pitcher that orders its own filters when the old ones need replacement is a boon. That’s when they’ll want the Brita Infinity Smart Water Pitcher. It works like any other Brita filtered water pitcher except that when it’s time for replacement filters, the wifi-enabled pitcher will automatically order another one from Amazon through the Dash Replenishment. You’ll never be scrambling for water filters again. The BPA free pitcher can hold 8 cups of water at a time and the filter will last for up to 40 gallons of water. This is one of those gifts for people who frequently forget to carry out mundane tasks or for those who just hate them. If someone is serious about filtered water and never has time to run out and get a new filter, the Brita Smart Pitcher might be right. If you think a basic water filter pitcher is a better idea, we have the top rated ones reviewed here.